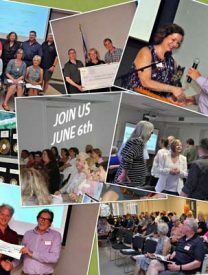 Centre Wellington Community Foundation (CWCF) is a public, charitable foundation created for and by the people of Centre Wellington. 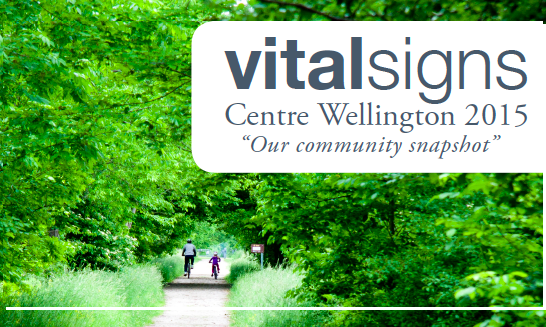 Our mission is to strengthen the Centre Wellington community by helping donors to achieve their giving goals, and by helping local non-profit organizations find resources to support their important work. We welcome your donation. All amounts, small or large, increase our ability to improve our local community of Centre Wellington. To give in Memory of Caroline Ann Kenny, please donate HERE and choose Caroline Ann Kenny Memorial Fund. 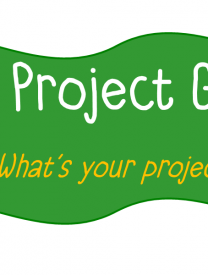 Application for Project Grants is now open. You can download the application HERE. You should read over the FAQ first which you can find HERE. 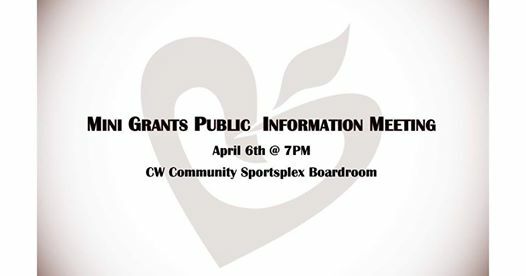 Project Grants open March 1, 2019, and Close April 1st, 2019 @ 5:00 PM. Feel free to contact us if you have any questions, grants@cwcfoundation.ca or call 1.888.713.4083. 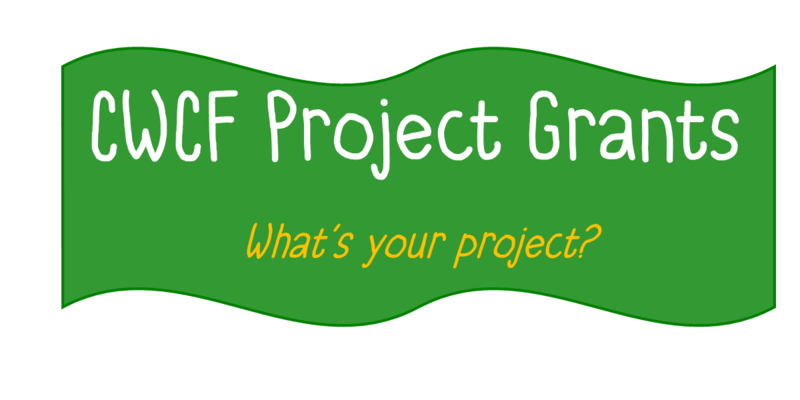 Thinking of applying for a CWCF Project Grant, formerly called Mini Grants? Whether you’re a new applicant to Centre Wellington Community Foundation or want to learn more about making your application the best it can be, please join us at our upcoming information session. We’ll cover timelines, application tips and answer any questions you may have. Let’s join together and give back today, GivingTuesday. This Canadian movement marks the “opening day of the giving season,” when charities, companies and individuals join together to share commitments, rally for favorite causes and think about others. Take the time today to celebrate the non-profit organizations that support our community in so many ways. Everyone is encouraged to support them with your time, talent and/or treasure. If you’d like to support CWCF go to www.GivingTuesday.cwcfoundation.ca, the team of Athol & Jason will match the first $2,000 in donations. This will DOUBLE your IMPACT. 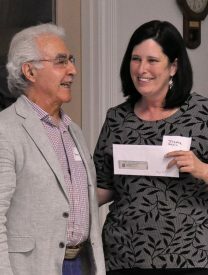 Congratulations to all those that received a Project Grant in 2018. Quesstions? Contact Raymond raymond@cwcfoundation.ca, 1.888.713.4083. 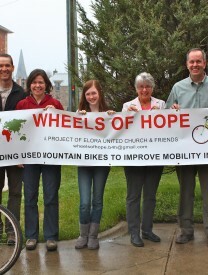 Saturday October 13th 9:00 AM – 12:30 PM, Elora Public Library-Community Room downstairs. You can find full details and buy tickets ($10 each), CLICK HERE. 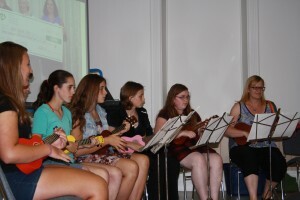 Saturday June 23rd 9:00 AM – 12:30 PM, Elora Public Library-Community Room downstairs. You can find full details and buy tickets ($10 each) at http://bit.ly/2sZFaFB. 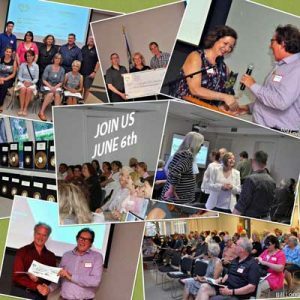 Come join us on June 6th for our Public Update and Project Grant Event. 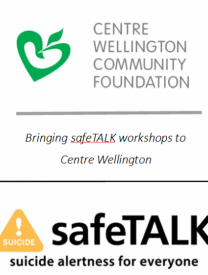 It’s a great opportunity for us and the Centre Wellington Community to share successes from the past year and talk about our plans for Community Building in 2018-19. 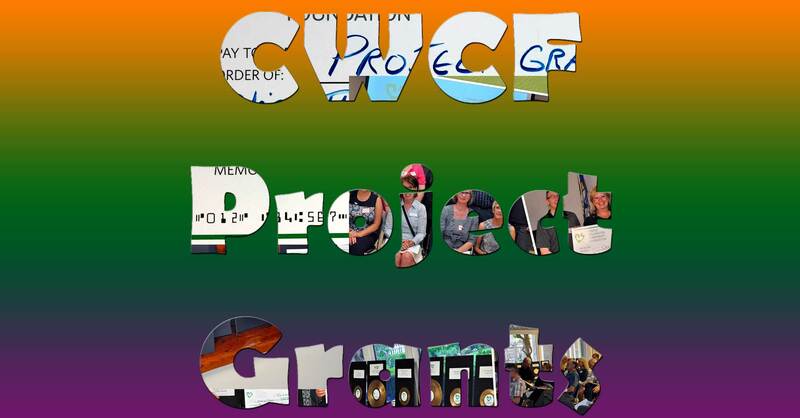 We will also present our 2018 Project Grant recipients, come see what they are planning to do with their CWCF Project Grants. 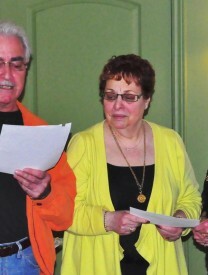 Plus, we are working hard on several new initiatives we plan to present on June 6th. The event is open to all, free and no registration is required. Meet and Mingle at 7:00 PM with the program starting shortly there after. 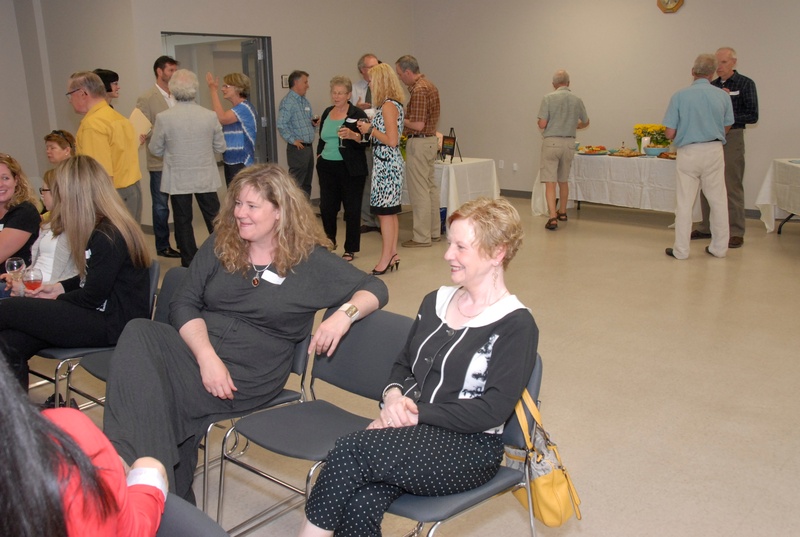 and Being held at Aboyne Hall, Wellington County Museum. You can get more details HERE. GREATEST HITS FUNdraiser is Back! 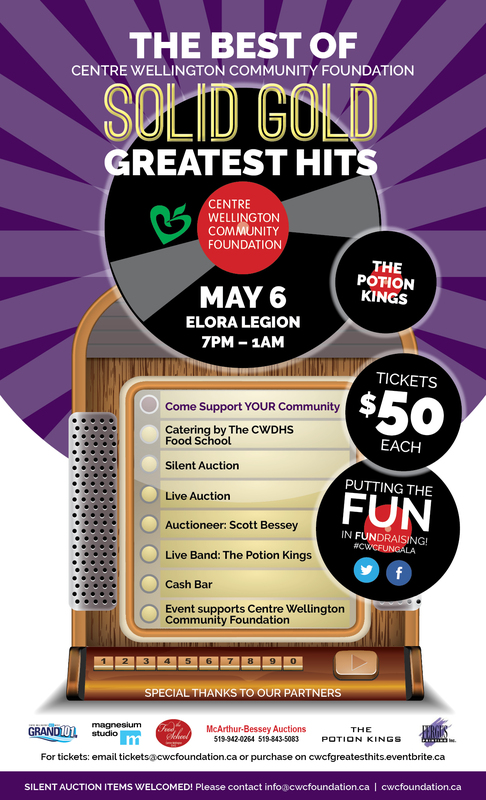 Come out for a great night of fun, food, music and dancing all in support of our local community and the Centre Wellington Community Foundation. Live Auction with auctioneer Scott Bessey. Centre Wellington Sportsplex Boardroom A. 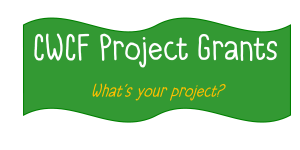 Thinking of applying for a CWCF Project Grant, formerly called Mini Grants? 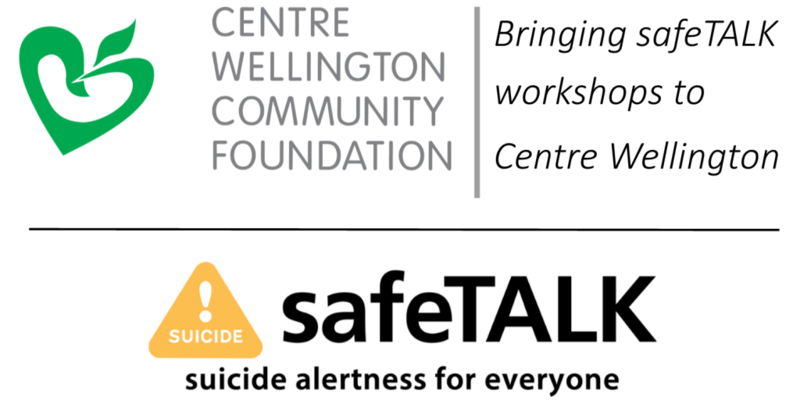 Whether you’re a new applicant to Centre Wellington Community Foundation or want to learn more about making your application the best it can be, please join us at our upcoming information session. We’ll cover timelines, application tips and the review process for CWCF Project Grants, as well as answer any questions you may have. On November 3rd our community will be celebrating Random Act of Kindness Day®. 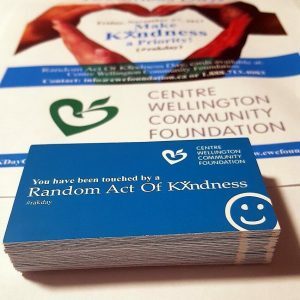 Centre Wellington Community Foundation is encouraging local businesses, schools, organizations and individuals to get involved by promoting the day within their own offices, classrooms, boardrooms, and networks. Contact CWCF to participate and to receive a free Kindness Kit raymond@cwcfoundation.ca, 1.888.713.4083. THE BEST OF SOLID GOLD GREATEST HITS! Wonderful food catered by CWDHS Food School under the guidance of virtuoso Chef Christopher Jess. 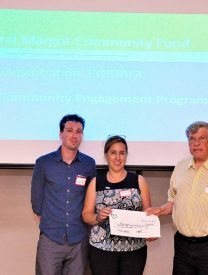 Once again we are pleased to support great community initiatives with our 2017 Mini Grant Program. Applications will be available at this website starting April 15th with a deadline for submissions of May 15th. 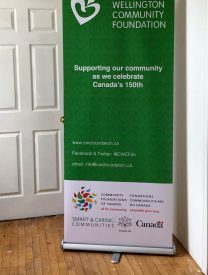 Building on last year’s major grants to local Canada 150 initiatives, we will be unveiling, just for 2017, additional funding opportunities for local initiatives fitting the Canada 150 themes and criteria. 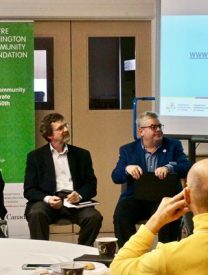 We are pleased to announce that granting is open for Community Fund for Canada’s 150th in Centre Wellington, a partnership between Community Foundations of Canada and CWCF. 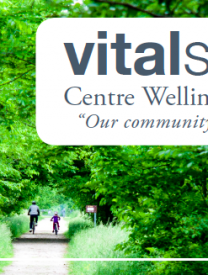 As we continue to build on our 2015 Vital Signs Report, we have committed to work with local community groups, through Vital Conversations, to help find paths to change and improvement. 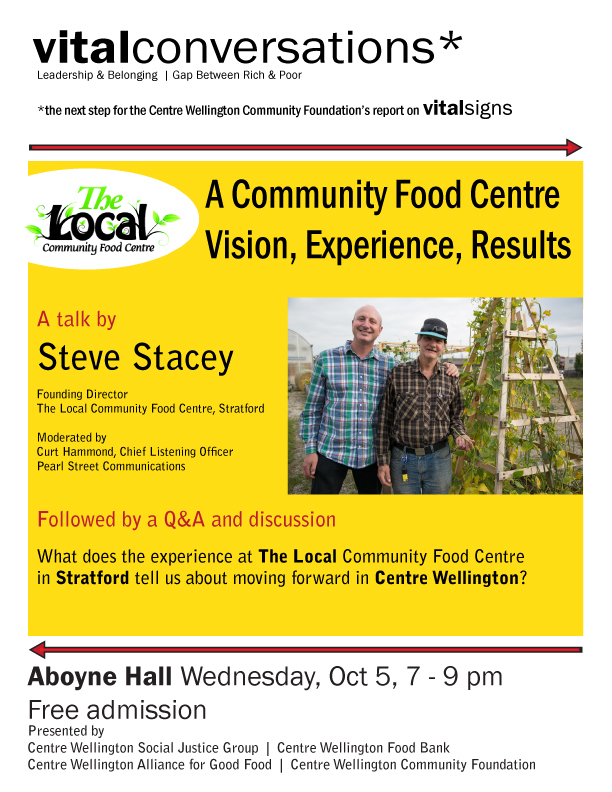 Partnering with Centre Wellington Food Bank, Centre Wellington Social Justice Group and the newly formed Centre Wellington Alliance for Good Food, Steve Stacey of the Local Community Food Centre in Stratford will explore with us this new model for food security. Moderated by Curt Hammond of Pearl Street Communications, this interactive talk will help us figure out ways to move forward locally. Wonderful news. 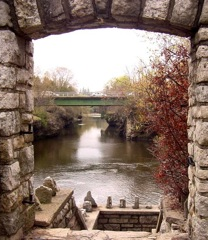 A five year community campaign to transform the environmental cleanup legacy of a 1930’s gas station to “the new centre of Elora” has finally been paid off. 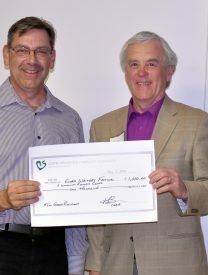 CWCF is pleased to have been able to help out this fundraising with our Elora Green Space Fund. This is a project that is loved by tourists and locals alike. To learn more, listen to an interview on May 31, 2016 on Swap Talk on The Grand 101.1 where our very own board member Jason Thompson is in dialogue with tireless citizen volunteer (and councillor) Kirk McElwain and Elora BIA Administrator Fred Gordon. 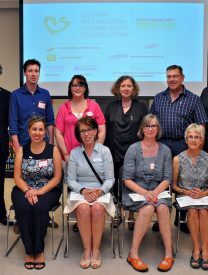 There was a great turnout last night at Wellington County Museum when we revealed the 8 wonderful community projects receiving a Mini-Grant from four of our funds. It was particularly poignant to hear each of the projects tell a story of their impact in the community and how they enrich all our lives. 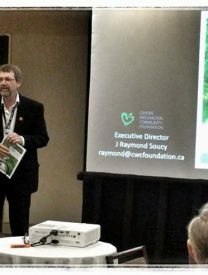 We began with an update on the last year’s activities for CWCF, including our Vital Conversations follow on to last year’s Vital Signs report and an update on the other grants that the Foundation has issued. 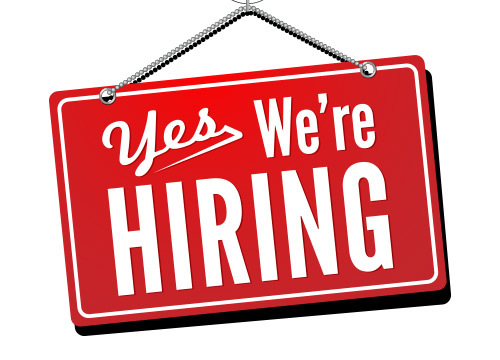 To help us better engage our community and grow our activities, we are seeking an exceptional individual to be our first Community Foundation Coordinator. Stay tuned as we announce our new team member shortly. 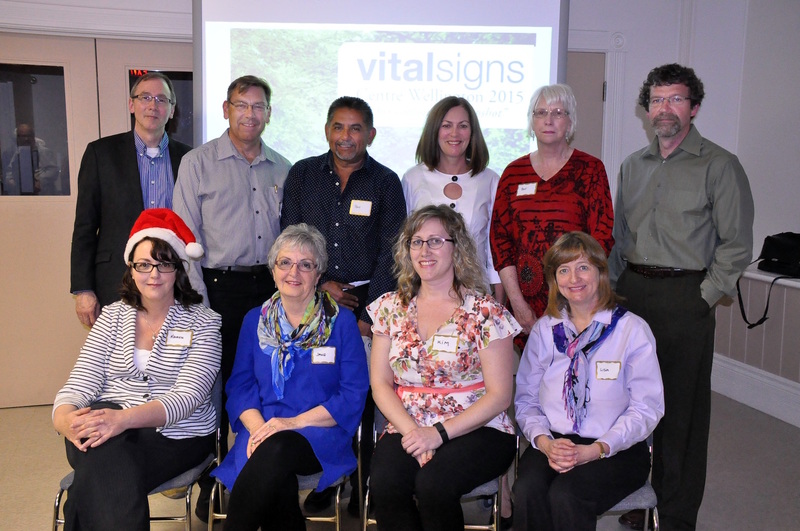 Meet and mingle, followed by an update on mini-grants, our progress and Vital Signs. 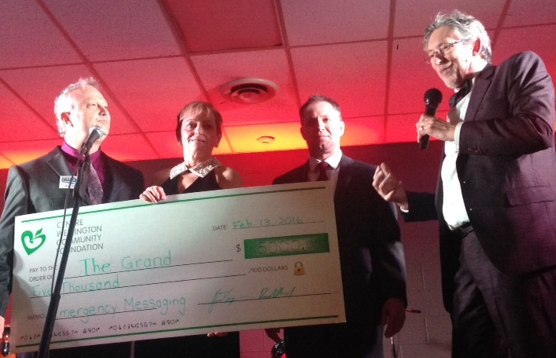 We are excited to announce that at The Grand 101 Gala on Saturday February 13, 2016 at Elora Community Centre, that CWCF supported the ircritical emergency messaging project with $5000 coming from Kate and Margot Fund and Middlebrook Community Fund. More details are in the press release. 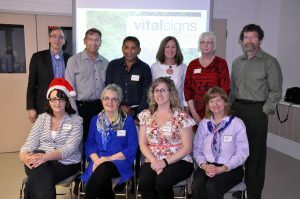 We join communities across Canada to launch our first ever Vital Signs report specifically for Centre Wellington. 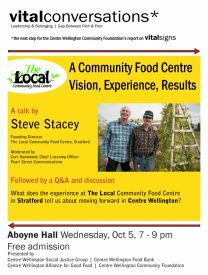 The report was launched to a full room at Aboyne Hall where we challenged our community to start the dialogue. Click on the photo for more information and the report. 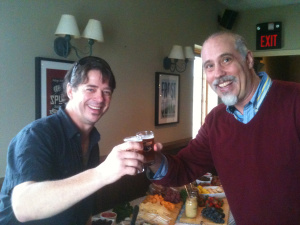 Jason Thompson and Athol love to engage community in some very creative fundraising events that definitely move the needle: Click here to read their story. Thanks for your creativity and passion for community. 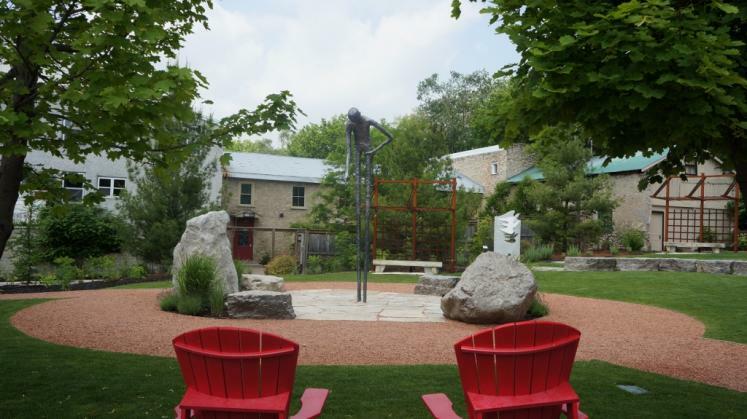 Through a wonderful community collaboration, the Elora Green Space has transformed the historic hear t of Elora. Generous in-kind and cash contributions by many organizations and individuals have left us with a mere $15,000 left to raise, representing about 5% of the overall project cost puts us on the home stretch. At our June Annual Community Gathering, we revealed the community projects receiving 2014 Mini Grants. Click here for a detailed information on our successful mini-grant applicants. That evening, there was also an engaging panel of various community leaders exploring various aspects of our community – what it can be and what is still needed. 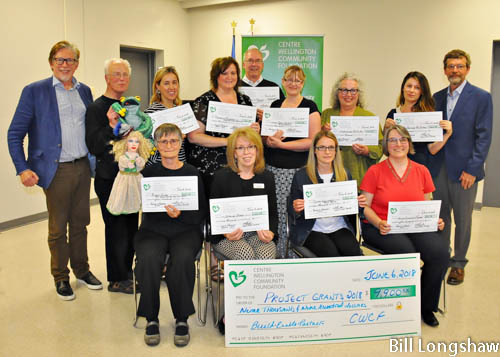 A previous mini-grant recipient, Stephanie Lines-Toohill so engagingly described the community interconnections and overall impact of her Tutu in You – Elora Monster Month Parade initiative in support of Centre Wellington Foodbank. Running a fundraising event? 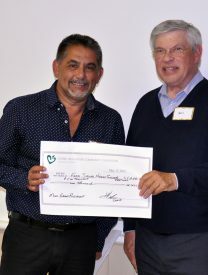 Perhaps you are looking for a good way to support charitable works right here in our community. We have prepared a THIRD PARTY FUNDRAISING TOOLKIT so you can support great community projects via your Community Foundation. More details here. We celebrate the life and community giving of the late Rhoda Lipton, a founding Board member of CWCF and also creator of our first Donor Advised Fund. She has been an inspiration to all of us. Read her story here.